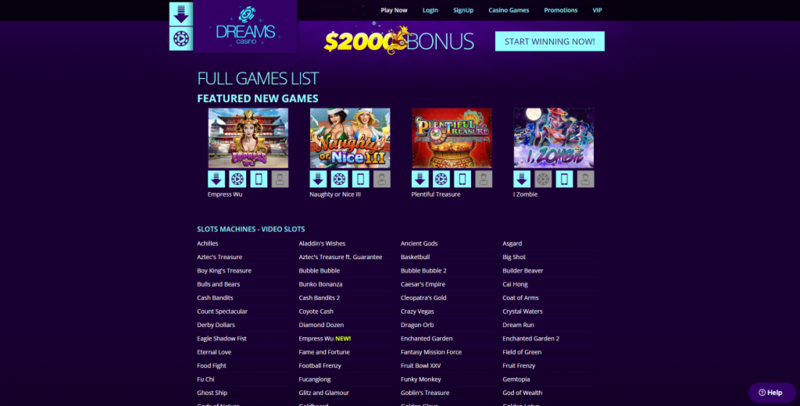 Dreams Casino is a well known operator which came online in 2005. They have been in the online gambling business for a long time and have a big number of satisfied customers. The casino can only be accessed in English and players can only choose US dollars as a currency. They are licensed in the jurisdiction of Costa Rica and their casino games are proven to be fair by iTech labs. Players can access the casino games in instant play, download or mobile mode. Dreams Casino is power by Realtime Gaming software. Players can enjoy a big number of video slots at the casino, most of which come with a jackpot attached. You can also try your luck on video poker and table games, but the casino doesn’t offer any live dealer games at the moment. If you decide to play for real money at Dreams Casino you can make a deposit by using Credit and Debit Cards, like Visa, Master Card and American Express. You can also make deposits by using Neteller or Bitcoin. For withdrawals you can use the Neteller, Bitcoin, Bank Transfer and Bank Checks. The casino has a relatively long payout timeframe. All withdrawals remain pending for 10 to 15 business days and are processed to e-wallets within 10 days. The maximum you can withdraw in one week is set at $2,500. Being an RTG casino it’s expected for Dreams Casino to have a rich bonus offer. The welcome bonus at the casino is a hefty 200% match deposit bonus up to $2,000. You can claim this bonus on your first deposit at the casino by redeeming the bonus code DREAMS2000. Once you use up the welcome bonus you can claim another 200% match deposit bonus on your second deposit at the casino by using the bonus code DREAMS200. All bonus promotions at the casino come with a wagering requirement of 30 times the deposit and bonus amount before a withdrawal can be made. Once you become a regular player at the casino you can expect to receive many more great promos on your account. If you ever have the need to get in touch with the casino you can easily do so by using the live chat icon. They are online 24/7 and an operator will help you with any query. You can also contact the casino by email at help@dreamscasino.com or by phone at 1-678-349-0358, 0-800-032-9334 and 1-800-480-2498.